During the last decade we saw the top Online Travel Agencies (OTAs) move into the top 10 agencies in the US and Expedia took the #1 slot, surpassing the old guard, American Express and Carlson Wagonlit. Consumers voted with their wallets, with both leisure and corporate travelers enjoying the 24x7 access, coupled with choice and control. The power of the OTAs is undeniable and the angst of the suppliers, agencies and corporate travel managers alike over their growth and popularity is palpable. Suppliers are concerned, because the OTAs bring in a lower average rate, but still cost them a booking fee and some type of volume related compensation (whether it is a commission or a volume override). Agencies, because it is costly to deploy an online presence and with the OTAs spending six figures marketing their sites, it can feel like rolling a snowball uphill in the sun. Lastly, corporate travel managers object because the number of rogue travelers has increased, booking outside of the designated channel, often with an OTA. During this same time, beyond the Internet becoming ubiquitous for booking travel, we also saw mobile mature significantly, both in the sophistication of design and the proliferation of devices. Mobile is not an optional strategy. 85% of mobile devices will be web enabled by next year. And Google now reports that mobile searches grew 4x in the last year. Social media has burst onto the scene in the past 5 years, forcing companies to take a multi-channel approach, depending on such tools as Facebook, Twitter and Pinterest to reinforce their brands and hawk their wares. Social commerce is still a bit elusive, but it is definitely coming. With the popularity of online travel and mobile and the rapid growth of the social media phenomenon, travel agency and travel management companies have been at a disadvantage to their OTA cousins and the travel supplier communities. All but the largest agencies and TMCs do not have IT departments. For years, the GDS played that role on their behalf. As a result, so many companies have not able to adequately compete on these new fronts. By 2010, the number of ARC approved agencies had declined more than half and by the end of the year the total stood at 14,795. In 2012, we are now at 13,857, lower than 1978, when I first joined the industry. The interesting thing is that due to the impact of the OTAs and the higher average air ticket prices, the total annual air ticket sales per ARC for those agencies in 2011 was $82.1 billion, versus $11.4 billion in 1978. The remaining agencies are stronger than their predecessors. The average annual air ticket sales per agency for the remaining 13,857 is $5.8 million today, versus $772,000 in 1978. 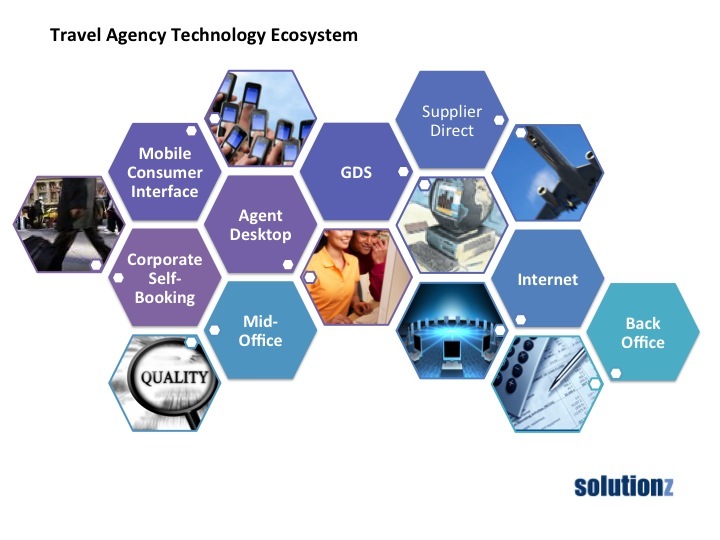 Last year when I attended the Global Business Travel Association Conference (GBTA), I was amazed at the number of travel technology vendors that had emerged since the last time I attended (when it was still NBTA). Not only that, but I was overwhelmed with all of the different categories that an agency had to consider in their technology "stack". This is daunting for the TMCs that have a large IT staff to sort out all of the options, and impossible for those that don't even have a network administrator. As I developed this graphic, I thought back to my days at Bay Travel and wondered how it all got so very complicated. Between Agnes, Cherie, Jill and I, we did everything and produced $3m in annual revenues. I realize that as a group, with our limited tools, we were not "scalable". Had that same team faced running an agency in 2012, in order to scale, we would have needed to a technology stack that we could deploy without a full time IT person. We definitely would have needed access to the Internet at each agent desktop. We would also have needed a solution that would help us handle the client's need to book wherever they want to, yet not sacrifice the ability to perform quality control, ensure policy compliance and consolidate the data for reporting and accounting. And while we were at it, we would have asked for world peace. Where will the Odyssey Take Us? There are several 1000 pound gorillas in the room that introduce some wildcards into this Odyssey. And I am not talking about the GDS companies or the suppliers. One is Google. With very deep pockets, a big stockpile of cash for acquisitions and a vested interest in travel, it will be interesting to see their direction in travel. While their efforts may be focused the leisure part of the market, corporate travel can't be far behind. The other is Apple. They have filed a patent for an iPhone travel app and they are brilliant marketers. Everything they do, they do with simplicity and elegance. And if they finally get Siri right, corporate travel could be in their sites. And speaking of simplicity, I believe that the next ten years will look a little more like "back to the future" than 2001: A Space Odyssey. We will revisit those things that worked and tweak them to suit our current challenges. We will strip out those things that don't work. We will find ways to cope with the further fragmentation. And hopefully we will focus on finding a business model that is a win-win for everyone involved in marrying buyers and sellers in this industry. Stay tuned as I muse on what to write about next and while I figure out whether it will be worthwhile to see what GBTA holds this year. It might be worth going just to see two former US presidents, the CEO of AMR/AA and a Saturday Night Live star, all on the same agenda.